Superboy #1 | Hey Adults! Comics! When they decided how to reboot Superboy, they went all in. They’ve rebooted him further back than we’ve ever seen the character before. Any further and the first issue would be nothing but illustrations of in-vitro fertilization. It starts out with him in the ubiquitous human-sized, fluid-filled tube, connected to wires of various sorts. He’s conscious, but his creators don’t know it because the writers have decided to get all weird with his physiology and his consciousness is spread throughout every cell in his body. Should be interesting watching him lose memories when he gets cut. Of course, they won’t do that, they never do. OK, I know one place where they come to that logical conclusion: the web strip Schlock Mercenary. (Warning, this is a long running strip. it will take a long time to get caught up.) They’re very unlikely to do it with a major, established character in a mainstream publication. One thing I really dislike about his new origin, is this distributed consciousness. It makes sense in shapeshifters and their ilk, but not for this character. They put him in a virtual reality and monitor what he does in it. The lead scientist states “This program was designed to plumb the depths of his cellular subconscious – ” (They bold “program”, apparently feeling the need to drive that idea home.) “To try to bring the memories of his original genetic donors to the surface.” What? Now his memories are genetic? It isn’t enough to have an inane “distributed consciousness” they have to give him memories from the people that his genetic material comes from? We know who his genetic donors are supposed to be and neither has a “distributed consciousness”. It’d be very strange if they gave this oddness to Superman as well and Luthor certainly doesn’t have it. So where did this come from and how in hell would that work? SF is one thing, but this is pure babbling fantasy. Superboy is an interesting enough character on his own without all this nonsense. It feels like they’re desperate to get to the reveal of his genetic donors and because they’ve written themselves into a corner in other ways they’re throwing this in there so they can still get to it without lots of searching and investigation. When it comes down to it, a reboot like this is kind of cheating. Sure, you’re starting new stories and can pick and choose what background to maintain, but the characters, no matter how early you start in their story, are still established characters. Most often, they still have a large part of their established environment and friends, you’re just going to make the stories a little different. In fact, this is so expected in a reboot and so much of it does indeed follow this line, that when they introduce new characters, especially new major characters, it is jarring. It doesn’t really happen in this title, but it seems to happen in a few. Of course if those new characters don’t last long, they don’t really count, they’re a plot device not a character. It’ll be awhile before we can tell who lasts and who doesn’t. For some reason they’ve thrown Rose Wilson (Ravager and Deathstroke’s daughter) into the series. Is she going to end up being a teammate as well? Did they just need another recognizable character in the series? I’m hoping they use her well here. They seem to be taking a lot of this Superboy’s attitude from the Young Justice cartoon, not the anger so much as the detachment. He’s had no chance to learn how to interact with other intelligent beings and he’s been betrayed frequently in just this first issue. At the close of the first issue, the people who have created him have decided to send him to kill some heroes that have been troubling them, of course, they’re the Teen Titans or Young Justice or whatever group they are calling themselves. We’re likely about to be treated to the oldest superhero team trope of all: Heroes meet, there’s a misunderstanding (or one is lied to about the others), they fight, they realize the mistake (or uncover the lie) and all team up to fight the real bad guys. There’s a place for revisiting the old standards, let’s hope they do something worthwhile with it. 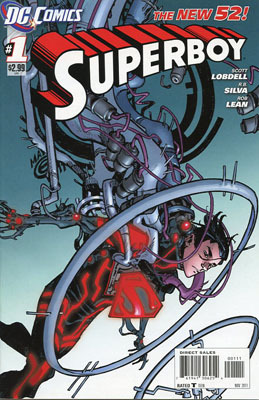 This entry was posted in Uncategorized and tagged Ravager, Schlock Mercenary, Superboy. Bookmark the permalink.